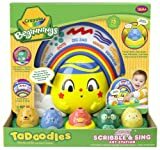 TaDoodles Scribble and Sing Art Station includes five first markers and one art station that recognizes color and character names. Plays music and playful guidance to inspire first marks…. A beginning building set of rubber blocks that are easy to grasp, hold, and connect with their unique shape. 20 pc. Set. Ages 6 mos. +. Spark your baby’s sense of creativity and wonder with Crayola’s Beginnings Baby Roll and See. It’s magical fun for your little one! Two fun characters change color when baby rolls them….